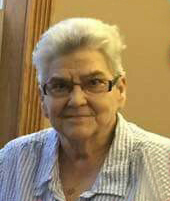 BARBERTON—Joyce M. Carr (nee Byrd), 74, passed away April 12, 2018 at the Hospice Care Center. Joyce was born in Vincennes, IN and had been a Barberton resident most of her life where she worked as a crossing guard for the Barberton City Schools. Joyce was preceded in death by her husband of 50 years Ernest; step-father Carmel Dinuzzo; mother Margaret Dinuzzo; sister Anita Byrd; and brother Alexander Dinuzzo. She is survived by her loving son Mark (Ashleigh); granddaughter Audrey; sisters Peggy Sue (Dave) Sample, Josephine Dinuzzo and Jeraldine Becker (Bruce, deceased); special nephew Scott Dinuzzo; and special friend Brandy Shilts.